2014 was the hottest year ever measured on Earth. Last year, 2014, was the globe’s hottest year ever recorded by thermometers, and likely the hottest in the history of human civilization. 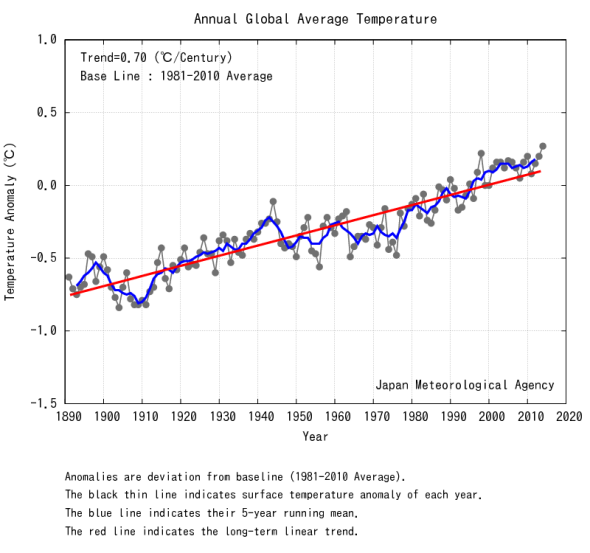 This week’s data come from Japan’s Meteorological Agency, one of the four primary record-keeping organizations that routinely plot the now familiar upward bend in Earth’s surface temperature. The new record amounts to yet another warning sign on the civilizational superhighway toward a worst-case climate scenario. Greenhouse gas emissions also hit a worldwide high in 2014, meaning global warming continues to accelerate, not ease. Projections suggest that global carbon emissions will hit another high in 2015, thanks to continued economic growth and a recent dip in oil prices. Last year Europe, the Arctic, Africa, Australia, South America, the Caribbean, western North America, and East Asia experienced warmer-than-average temperatures, while colder-than-normal areas were limited to Central Asia and the Eastern United States, according to the JMA. Data from other agencies showed global oceans contributed the most to the new heat record, breaking the all-time temperature mark despite the lack of an official El Niño—a periodic warming of the tropical Pacific Ocean that in the past has been linked to global temperature records. Ongoing warming is contributing to profound changes in ecosystems around the world, separate studies have recently shown. Poleward shifts in tropical fish species and shifting bird habitats are some examples of effects beyond those affecting purely human systems, like the impacts to agriculture and water supply due to record-setting droughts in California and Brazil. To turn the tide on rising temperatures would require a herculean effort and heretofore unseen global coordination—but it is possible. The recent Deep Decarbonization Pathways Report examined the policies necessary for 15 of the leading world economies, including the U.S. and China, to reduce emissions 45 percent by 2050, consistent with keeping global temperatures in the “safe” range of a less than 2 degrees Celsius rise. Following that plan is quite possibly our best shot at maintaining a planet resembling the one we have now. Otherwise, get ready for many more January news stories like this one. Even more impressive, the last global record-cold year was way back in 1909. The way things are going, there won’t be another one for hundreds of years.